Our political system is sick. Just when you think the patient is recovering, another wave of bile bubbles up. Is it any wonder that fewer of our best and brightest are willing to risk the truculent tweets and sardonic sound bites of a public life? The year was 1960. 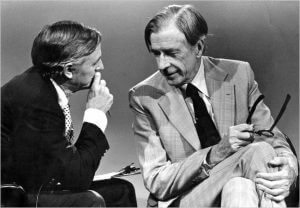 No one was more aggressive in advancing his political beliefs than the conservative author, columnist and commentator William F. Buckley Jr. And yet, at his death in 2008, he counted most of his former opponents as friends, a phenomenon sorely missing in the throes of today’s political infirmity. How did he do it? Some hints can be found in a new book entitled “A Torch Kept Lit,” edited by James Rosen, a collection of obituaries about Buckley’s former adversaries penned by him for his National Review magazine. Buckley’s tack was to focus on the message with grace and wit, never the messenger. This kind of self-effacing style characterized Buckley’s approach to political combat, but never compromised his ordnance. He directed fire only at the issues, never his opponent. After witnessing a year of withering discourse between wind-up candidates, I think we could use a tincture of Buckley’s tonic. Friends fight fair. It would go a long way to quell today’s political reflux. For me, Kerry is too far to the left. But, this one he got right.